Excitement was in the air at the Mhadei Wildlife Sanctuary in Goa as a Black Panther made a rare appearance in the small hours on Sunday. Their rare occurrence is attributed to the fact that they are few in number. When S K Tripathi, a soldier from Indian Army’s Western Command Signals Regiment was on duty, he spotted a Sambar Deer fawn being attacked by a pack of stray dogs who were biting the helpless creature. The soldier sprang into action immediately and saved the deer from the onslaught. 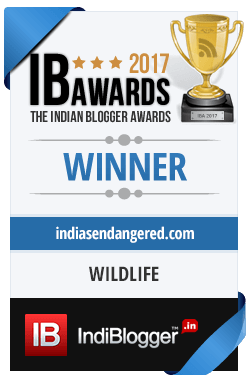 Elevating the conservation status of the Great Indian Bustard, The Bird Life International and IUCN have declared the bird as a critically endangered species. The present population of Bustards stand at just 300 covering six states in India. Pune based NGO Ela Foundation and the National Institute of Virology (NIV) have recently published a research paper that analyses the cause of drastic fall in the vulture population of India. While many believe the main reason for the deaths is use of Diclofenac, a chemical that is fatal to the birds, the research papers suggests other reasons too including electrocution. The appe midi mango varieties in India, know to be excellent for pickle making, are now being conserved by Bangalore University after different varieties were found to become rarer due to usage. What would happen if there were no tigers in the forest? The deer population would increase drastically eventually clearing up the whole forest. It is the same shocking scenario that has come into the forefront after University of British Columbia researchers found out that the number of big predatory fishes in the world oceans is depleting due to over fishing by humans. Small fishes on the other hand are thriving and over the last 100 years their numbers have doubled. It is ‘Destination India’ for the World Environment Day 2011 (WED) which falls on June 5th, for “embracing the process of transition to a green economy”. This year’s theme ‘Forests: Nature at your service” emphasises that quality of life and the well being of forests and that of ecosystems are closely knit. For the first time, India is named as the host by the UNEP-The United Nations Environment Programme. The theme is also in support of United Nations International Year of Forests. IUCN stands for International Union for Conservation of Nature. It is the world’s leading organisation that deals with conservation issues. The ‘Lost Amphibians of India’ was an ambitious project started out three months ago specifically to look for those rare amphibians who had not been traced in the wild or otherwise for many years. With a list of 50 to start with, the researchers have already succeeded in locating five of the lost frog species. State Forest Minister wants to Auction Wild Animals! It is a statement that is throwing every wildlife conservationist in a tizzy. The state forest minister of West Bengal said to the press that as West Bengal had wild animals ‘in excess’ he had a proposal to sell the animals to private owners, who could bid for their favorite animal.